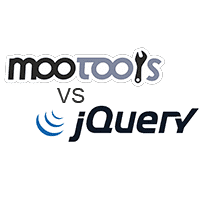 JQuery or Mootools, Which is better? As I began looking for a solid JS Framework I found a plethora of possibilities, however, it did not take long for me to narrow the list down to just two realistic options, JQuery and Mootools. These two frameworks both have their fair share of supporters and opposition. In fact when it comes to comparing the two, a simple Google will reveal that most developers are asking the same question, which is better?